Speaking of the meeting between Pope Paul VI and Archbishop of Canterbury Michael Ramsey in 1966 – the first such public meeting of a Pope and Archbishop of Canterbury since the Reformation – and their Common Declaration, Pope Francis and Archbishop Welby said that their predecessors had “recognised the ‘serious obstacles’ that stood in the way of a restoration of complete faith and sacramental life between us. Nevertheless, they set out undeterred, not knowing what steps could be taken along the way, but in fidelity to the Lord’s prayer that his disciples be one. “Much progress has been made concerning many areas that have kept us apart. Yet new circumstances have presented new disagreements among us, particularly regarding the ordination of women and more recent questions regarding human sexuality. “Behind these differences lies a perennial question about how authority is exercised in the Christian community. These are today some of the concerns that constitute serious obstacles to our full unity. “While, like our predecessors, we ourselves do not yet see solutions to the obstacles before us, we are undeterred. In our trust and joy in the Holy Spirit we are confident that dialogue and engagement with one another will deepen our understanding and help us to discern the mind of Christ for his Church. Augustine became the first Archbishop of Canterbury and the church – part of a monastery – has a unique place in the history of the Church in England and the Anglican Communion. 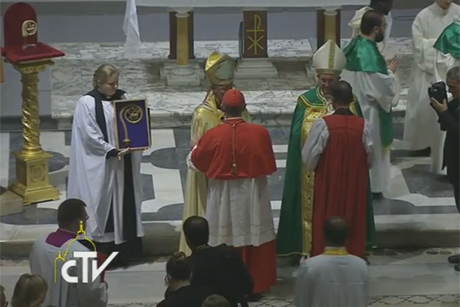 During the service, Pope Francis presented Archbishop Welby with a replica of the Crozier of Pope Gregory. The actual crozier of the sixth century Pope is stored in the church, and was sent by Pope Francis to Canterbury in January as the Primates of the Anglican Communion gathered in the Cathedral for their historic meeting. He continued: “Pope Gregory, from this wellspring of mission, chose and sent St Augustine of Canterbury and his monks to the Anglo-Saxon nations, inaugurating a great chapter in evangelisation, which is our common history, and binds us inseparably. 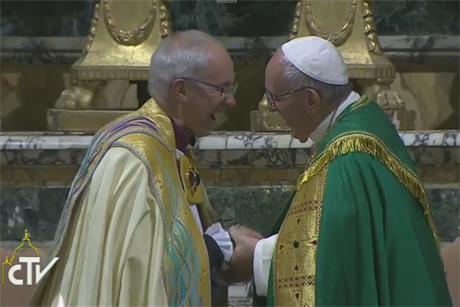 Archbishop Welby presented Pope Francis with his Pectoral Cross symbolising the Cross of Nails – the international reconciliation ministry based at England’s Coventry Cathedral. 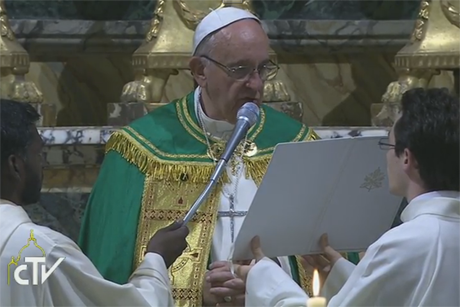 To loud applause from the congregation in the church of San Gregorio al Celio, in a moving part of the service of Vespers service, which the two leaders jointly led, Archbishop Justin removed the pectoral cross from around his neck and presented it to Pope Francis, who then put the cross around his neck. Before its journey to Rome, Archbishop Justin blessed the Cross of Nails at a service in Lambeth Palace Chapel, during which Lambeth Palace became the 200th partner of the Community of the Cross of Nails, an international network in 35 countries, which arose out of the vision of the former Provost of Coventry Cathedral, Richard Howard, who made a commitment to forgiveness and reconciliation following the destruction of the cathedral in 1940. As he blessed the Cross of Nails, the Archbishop said: “Bless His Holiness Pope Francis who inspired by the Cross of Nails, bears witness to the grace and truth of your crucified and risen Son, our Saviour Jesus Christ. . .
During the service, 19-pairs of bishops were sent out by Pope Francis and Archbishop Welby for joint mission in their local areas. Archbishop of Canterbury Justin Welby presented Pope Francis with a silver Cross of Nails Oct. 5 during vespers at San Gregorio al Celio in Rome, which they led jointly. Welby took the pectoral cross from round his neck and presented it to Pope Francis. The pope then put the cross round his neck. The pope presented Welby with a replica of the pastoral staff of Pope St. Gregory.